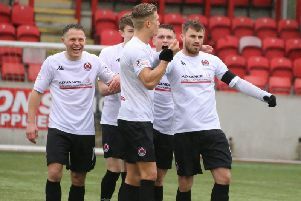 Clyde take on one of the only two sides below them in the table - weather permitting - on Saturday when they face Cowdenbeath. But as he heads for one of his old stomping grounds, new Clyde boss Danny Lennon is more interested in catching the sides above them than keeping Cowdenbeath at bay. Lennon reckons he has seen enough in his first two games in charge - both 0-0 draws - to encourage hope his side can start climbing the table. He said: “There’s no doubt about that. The results show that in terms of the clean sheets. “We want to turn those draws into victories. I always think the basis of any new manager coming in is to try and stop the run of losing games and help the boys gain a bit of confidence again. “I always believe the basis of a good team, a winning team, is not conceding a lot of goals. The weather not only wiped out Clyde’s game at Peterhead on Saturday, but it also scuppered Lennon’s alternative plans to watch Cowdenbeath or hold a training session on Sunday. But there were some consolations for the Bully Wee boss. He said: “We have found since we went in that the fitness levels seem to be to a good standard. “And it’s maybe a wee blessing because there were two or three of them suffering a little bit of flu symptoms. “It’s also important that we’ll be super positive this week that the game will go ahead. “I know how difficult a place Cowdenbeath is to go to with the size of the pitch and how tight it is. You’ve got to go there and compete. “We’re down at that end of the table with a slight cushion on us but we don’t want to look behind us. “We want to look forward and try to grasp and catch those teams in front of us.